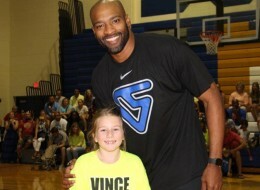 DAYTONA BEACH — Vince Carter spent the early part of his NBA career churning out one poster-making, highlight-reel dunk after another. Perhaps the biggest victim of “Vinsanity” back then — the most “posterized” of them all — was 7-foot-2, 260-pound former French center Frederic Weis. In a 2000 Summer Olympics game, Weis made the mistake of stepping in front of the 6-foot-6 Carter on his way to the basket. Carter took flight, leaping over Weis before throwing down a thunderous jam. 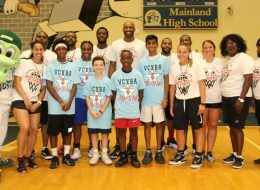 Much has changed for the 36-year-old Mainland product, who returned to his high school Tuesday to oversee his annual basketball camp. Playing in his 15th NBA season in 2012-13, the Dallas Mavericks shooting guard was still a productive player. Carter averaged 13.4 points, 4.1 rebounds and 2.4 assists in 81 games last season, but his game has changed. Does he still have the vertical to clear Weis? That is not to say Carter can’t still rise to the rim. But, he said, he is just more selective in doing so while choosing to rely on his jumper a bit more. 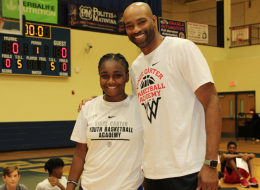 But the eight-time NBA All-Star and the league’s 2000 Slam Dunk Contest champ threw it down enough during his younger days to provide many a poster for young basketball fans. And now, Carter’s longevity means he is beginning to see some of those hero-worshipping young fans transform into NBA rivals. An article in The Toronto Star on July 9 told the story of a generation of young hoopsters who grew up in Toronto inspired by Carter’s high-flying antics during his time with the Toronto Raptors. The group included center Kelly Olynyk, a first-round pick of the Boston Celtics last month, and an early star of the NBA Orlando Summer League. Thus far, he said he has been able to keep up, in part, because of adjustments he made to his offseason routine. He said he maintains a target weight early in the offseason, and that the youth camp at Mainland acts as the building block for the start of his offseason workouts. “I feel good coming off last year,” he said. “The year before, I felt that I did OK. I felt good enough. But I put a lot of work in. Internet rumblings, however, place question marks beside Carter’s future with the Mavericks. There has been speculation the team could move Carter and his contract to create room to sign a big man. Carter reportedly signed a three-year deal with the Mavs in 2011 worth just over $9 million. But Carter squashed that talk Tuesday. So, perhaps the biggest question remaining for Carter heading into his 16th season is just how much longer does he have left? “I’m taking it year-by-year,” he said. “As long as the jump shot still works, I still have a job. There are some young guys in the league who specialize in just shooting. I feel like I can still have a job as long as I can shoot. I hate to put a time limit on (my career), but my goal, and I wish I knew why, I said I wanted to play 15 years once I got in the NBA. “There are a lot of great players that didn’t play that long. Now, going into Year 16, I’m thankful. Once this year is over, we will evaluate where we go from there.